The Western system of notation that has been in place for over four centuries is likely already very familiar to you. It is a binary system; that is, a note value divides naturally into two shorter notes, or two notes of equal value combine to form a single longer note. (See Example 20). Ex. 20 The binary organization of note values. These note values arrange themselves very neatly into the pulse streams of the duple metric structure we have been using in our discussion. In fact, you may have pictured note values as replacements for the dot structures used in earlier examples. If not, you may want to go over some of the practice routines already suggested and imagine note values replacing the dot structures. 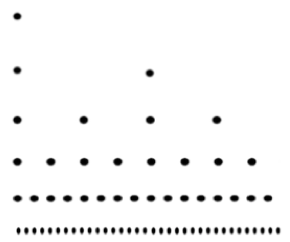 Example 21 shows the corresponding dot structure. The binary notation system indicates the relative speed of the notes. This means that once the speed of one note value has been set, the others will fall into place in whole-number proportions: if you hear the quarter note as the beat, eighth notes will be twice as fast, half notes will be twice as slow. Keep in mind that any note value can be assigned any tempo or speed. The indication M.M. * quarter note = 100 at the beginning of a piece means that one hundred quarter notes are to be performed in one minute. But M.M. eighth note =100 or M.M. half note = 100 are equally possible. Such tempos would then affect the speed of the quarter note. In M.M. eighth note = 100, 50 quarter notes would be performed in one minute; in M.M. half note = 100, 200 quarter notes would be performed in one minute. For more, see Additional Comments on Meter and Tempo, below.